Energy from offshore wind in the UK will be cheaper than electricity from new nuclear power for the first time. Two firms said they were willing to build offshore wind farms for a guaranteed price of £57.50 per megawatt hour for 2022-23. This compares with the new Hinkley Point C nuclear plant securing subsidies of £92.50 per megawatt hour. Nuclear firms said the UK still needed a mix of low-carbon energy, especially for when wind power was not available. The figures for offshore wind, from the Department for Business, Energy and Industrial Strategy, were revealed as the result of an auction for subsidies, in which the lowest bidder wins. In the auction in 2015, offshore wind farm projects won subsidies between £114 and £120 per megawatt hour. Emma Pinchbeck, from the wind energy trade body Renewable UK, told the BBC the latest figures were "truly astonishing". "We still think nuclear can be part of the mix - but our industry has shown how to drive costs down, and now they need to do the same." 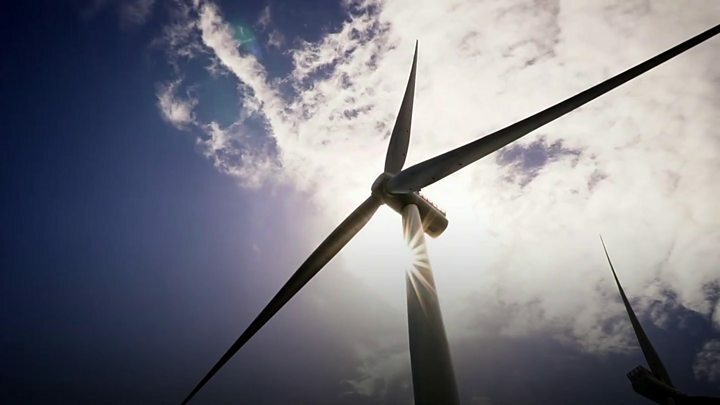 Bigger turbines, higher voltage cables and lower cost foundations, as well as growth in the UK supply chain and the downturn in the oil and gas industry have all contributed to falling prices. The newest 8 megawatt offshore turbines stand almost 200 metres high, taller than London's Gherkin building. But Ms Pinchbeck said the turbines would double in size in the 2020s. However, the nuclear industry said that because wind power is intermittent, nuclear energy would still be needed. Tom Greatrex, chief executive of the Nuclear Industry Association, said: "It doesn't matter how low the price of offshore wind is. On last year's figures it only produced electricity for 36% of the time." EDF, which is building the Hinkley Point C nuclear plant, said the UK still needed a "diverse, well-balanced" mix of low-carbon energy. "New nuclear remains competitive for consumers who face extra costs in providing back-up power when the wind doesn't blow or the sun doesn't shine," the French firm said. "There are also costs of dealing with excess electricity when there is too much wind or sun." EDF added that energy from new nuclear plants would become cheaper as the market matures, as has happened with offshore wind. Eyes will be raised at this suggestion, as nuclear power has already received subsidies since the 1950s. But storage of surplus energy from offshore wind is still a challenge. Onshore wind power and solar energy are already both cost-competitive with gas in some places in the UK. And the price of energy subsidies for offshore wind has now halved in less than three years. Energy analysts said UK government policy helped to lower the costs by nurturing the fledgling industry, then incentivising it to expand - and then demanding firms should bid in auction for their subsidies. Minister for Energy and Industry Richard Harrington said: "We've placed clean growth at the heart of the Industrial Strategy to unlock opportunities across the country, while cutting carbon emissions. "The offshore wind sector alone will invest £17.5bn in the UK up to 2021 and thousands of new jobs in British businesses will be created by the projects announced today." Michael Grubb, professor of energy policy at University College London, called the cost reduction "a huge step forward in the energy revolution". "It shows that Britain's biggest renewable resource - and least politically problematic - is available at reasonable cost. "It'll be like the North Sea oil and gas industry: it started off expensive, then as the industry expanded, costs fell. 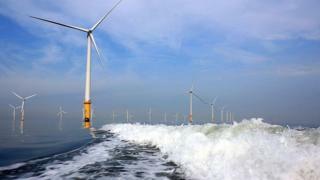 We can expect offshore wind costs to fall more, too," he said. The subsidies, paid from a levy on consumer bills, will run for 15 years - unlike nuclear subsidies for Hinkley C which run for 35 years. This adds to the cost advantage offshore wind has now established over new nuclear. Prof Grubb estimated the new offshore wind farms would supply about 2% of UK electricity demand, with a net cost to consumers of under £5 per year. Caroline Lucas, co-leader of the Green Party, said: "This massive price drop for offshore wind is a huge boost for the renewables industry and should be the nail in the coffin for new nuclear. "The government's undying commitment to new nuclear risks locking us into sky high prices for years to come. Put simply, this news should be the death knell for Hinkley C nuclear station." Along with three offshore wind farm projects, biomass and energy from waste plants have secured subsidies for low-carbon energy, with a total of 11 successful schemes in the latest auction. The £57.50 for new offshore wind power is not a true subsidy. It is a "strike price" - a guaranteed price to the generating firm for power it supplies. When the wholesale market price for electricity is below that price, payments to the firm are made up with a levy on consumers. However, when the wholesale price is above the strike price, the generator pays the difference back. It is a way of providing a certain return on investment for large energy projects. It is impossible to predict what the final additional cost to consumers will be because it depends on market conditions, but it will almost certainly be a fraction of the strike price itself. Experts warn that in order to meet the UK's long term climate goals, additional sources of low-carbon energy will still be needed. Follow Roger on Twitter @rharrabin.